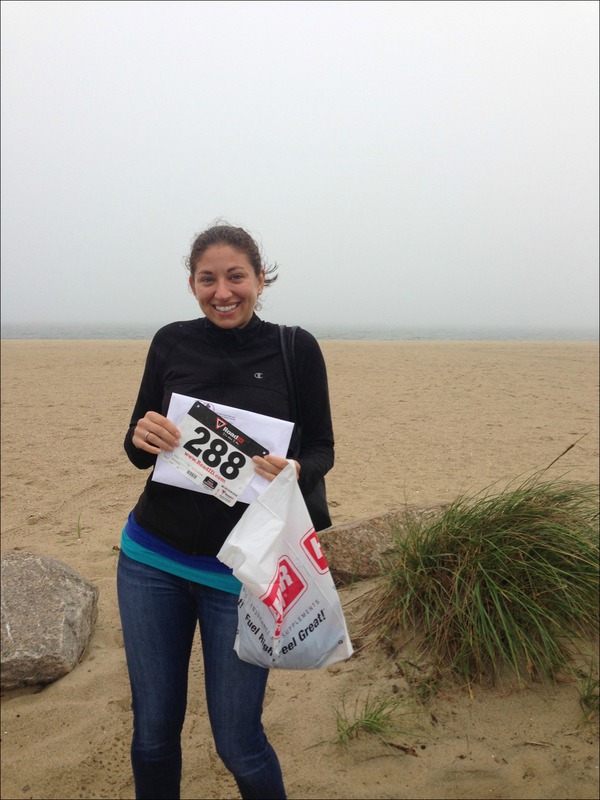 Well, the good news is my first triathlon is in the books! I didn’t get eaten by a shark, I didn’t drown and I didn’t fall of my bike. The bad news is I did come a little closer to one of those three things than I would have liked – but more on that later! Since I know there are a few of you who are thinking about doing a triathlon, I’m planning on giving a detailed recap of race day in 2 parts (before the race and the actual race) and I’ll also do a separate post along the lines of “lessons learned and tips”, so if you have any specific questions on doing your first tri please feel free to leave them in the comments and I’ll do my best to answer them! For this race packet pickup was offered on Friday afternoon or you could get your stuff Saturday morning before the race. Pat and I opted to take a drive over on Friday afternoon to get an idea of how far it was and to sort of get a lay of the land. We were both a bit nervous so it was helpful to get to take a look at everything before race morning! 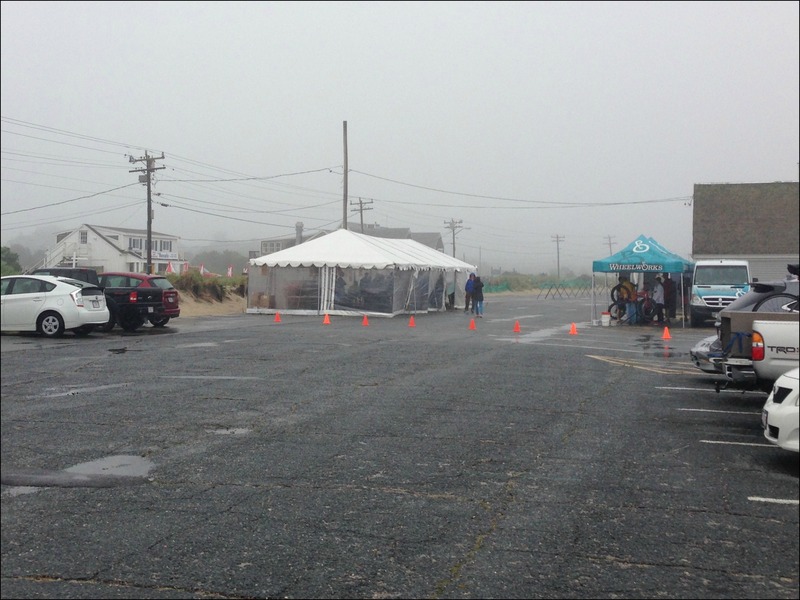 We ran from the car to the registration tent between downpours and were quickly able to grab our stuff and take a quick look around. This is my hair on humidity. And rain. And wind. And misty grossness. Race morning I rolled out of bed and I’m pretty sure the first words I said to Pat were, “Swim. Bike. Run. Nap.” Four hours of sleep was not a good first time triathlete plan. We entered the transition area and scouted out a good, easy to locate place to set up all of our stuff. Since it was raining on and off instead of actually unpacking my stuff and setting it up on a small towel like I had planned, I opted to just sort of organize it in an “easy to find way” in my bag so that it wouldn’t end up too wet. For the swim I had my wetsuit, goggles and swim cap and for the bike & run I had my helmet, sneakers, socks, sunglasses and my GPS watch. After we were all marked we had some time to kill until the pre-race meeting. We killed time with multiple trips to the bathrooms. As we got closer to the 7:15am meeting time we squirmed and shimmied into our wetsuits and made our way down to the beach. At 7:15am the race director went over the swim course and water conditions, reviewed the race rules and wished everyone – especially the first timers – good luck! The National Anthem was played and they began sending off the waves of swimmers! 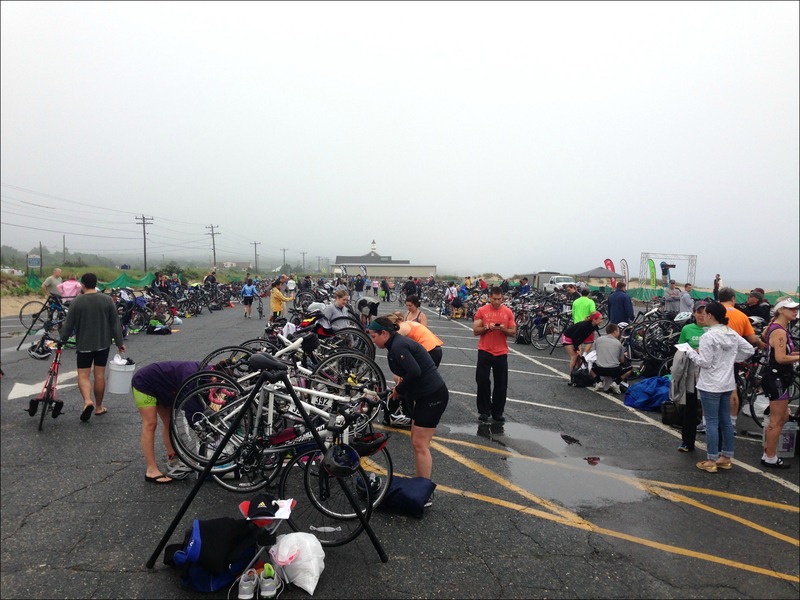 Up next – Swim, Bike & Run! P.S. 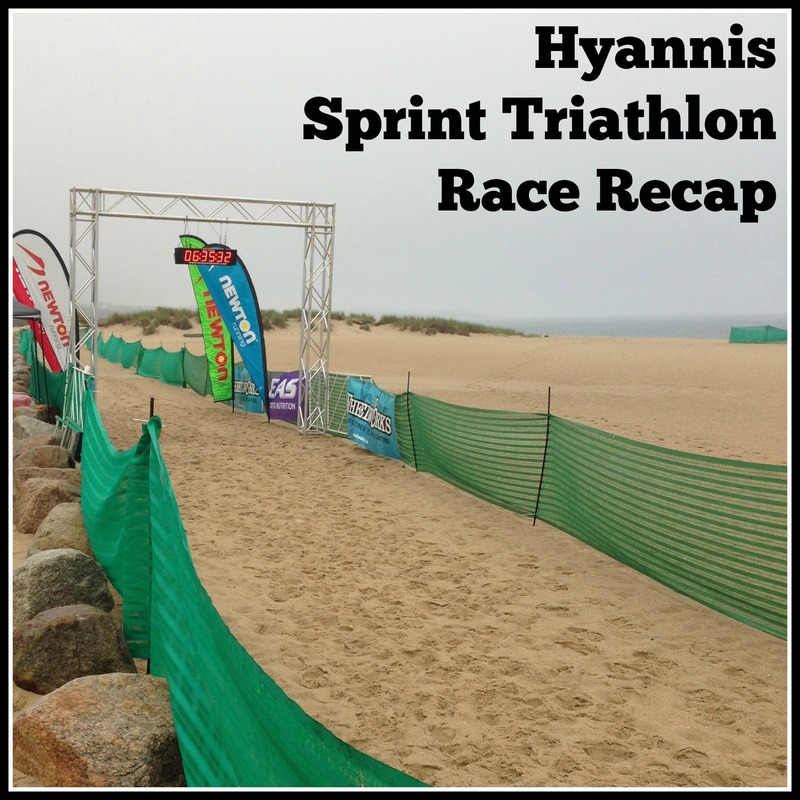 – Don’t forget to leave any first time triathlon questions! Can’t wait to hear how it went! I’m hoping that the thing that almost happened wasn’t a shark encounter… Eeesh. OMG I would be so nervous! Looks like a yucky weather day! It was one of those overcast humid misty days, it was just gross! Ooh, looks like a gloomy day for a tri. Glad you made it through! Looking forward to part 2! Yup, gloomy is a good word to describe it! The humidity was 98%, we were actually kind of glad it was overcast or it would have been HOT. Oh my goodness! I’m getting nervous/anxious just reading this! Since the swim is my biggest tri fear, I really hope that almost drowning (or being eaten by a shark) wasn’t the “almost” incident. But then again, I don’t want you to fall off your bike either. Is there a fourth option? Haha, it’s probably not quite as traumatic as I made it sound, but trust me, it didn’t all go quite as planned. Hopefully in part 2 we don’t hear about your tango with a shark! I love the idea of a two part re-cap. My trip to New Brunswick was eventful. I started writing yesterday, have 2,000 words and have not even gotten to race morning yet! Two parts it is! I’m freaking exhausted. Haha, yeah I did the same thing. I was writing my recap last night and by the time I got through the swim I was like, “man this is long…no one’s going to want to read something this long!” Two parts will hopefully work better! Out of those options, falling off your bike seems the least dangerous one. At least there were real bathrooms at the start. Haha, yeah there is A LOT more to do/ think about than just a running race! You. Are. A. Champ!!!! I’m inspired to finally get into that wetsuit and go after my first tri. Yes! Come do one on the Cape! I think the July one in Falmouth is sold out, but there is another one in Hyannis in September that I’m doing too! I can’t stand the suspense…. yay!! thank you for such a thought out post! I’m curious what you wore under your wetsuit, and how you worked bike shoes/socks and run shoes/socks. Also, how did the bike go? Did people pass you? Did you take in any nutrition while on the bike? Did you see anyone with a flat? Perfect, I’ll add this stuff to my “Tips & Thoughts” post! I don’t have clip in pedals for my bike so I just used the same sneakers for the bike & run and yes, I did see 1 person with a flat! I was totally not prepared for if I had a flat (or any other bike issues) so I would have totally just been done at that point! I’ll answer all the rest in upcoming posts! 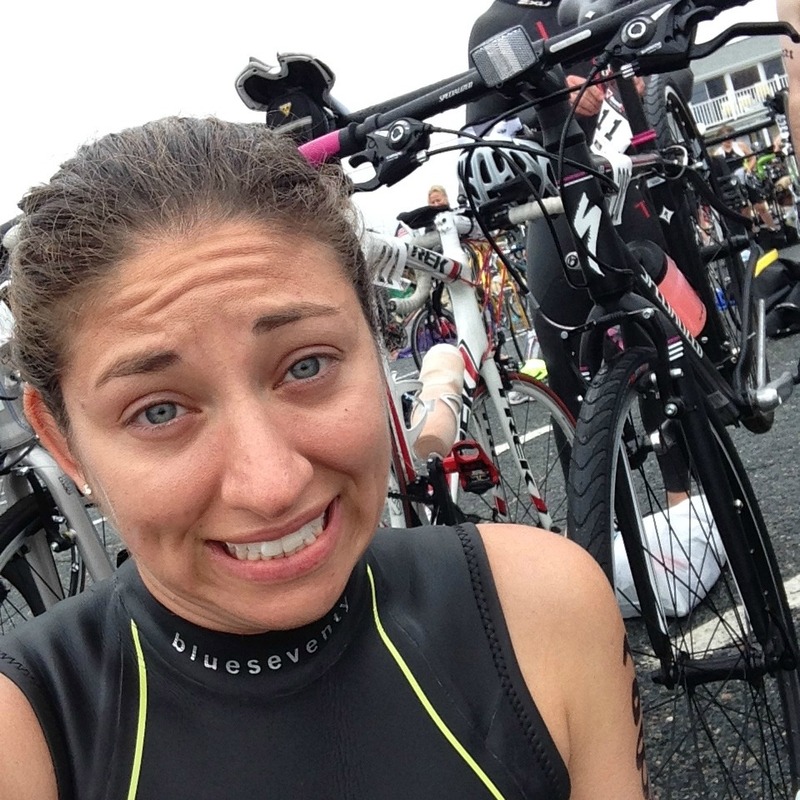 Way to capture the anxious moments before the race…especially the 10 bathroom stops! 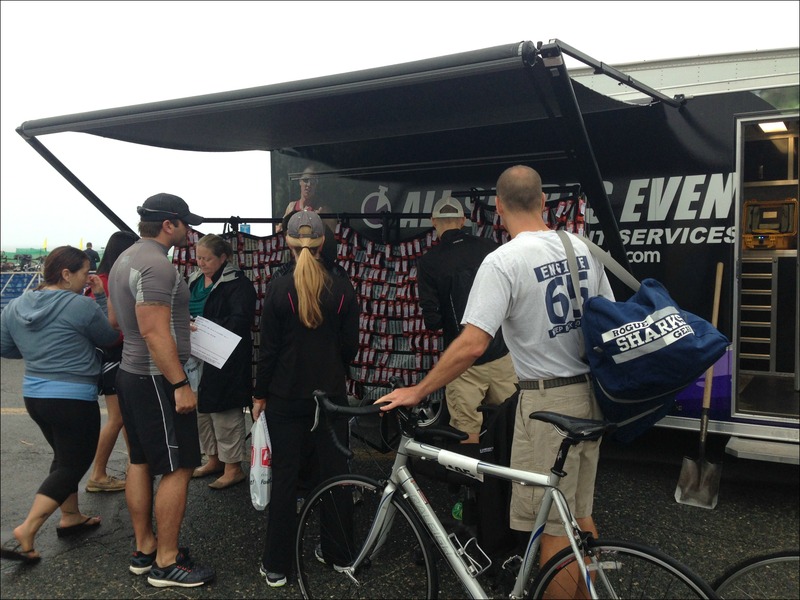 One thing to add about the transition area…good job scoping out the “easy-to-find” location. It is surprisingly difficult to find your bike when you pop out of the water. Also, many races will have you assigned to a specific rack in transition based on your age group/bib number. Yes, good point! I’ll add that in my “Tips” post! 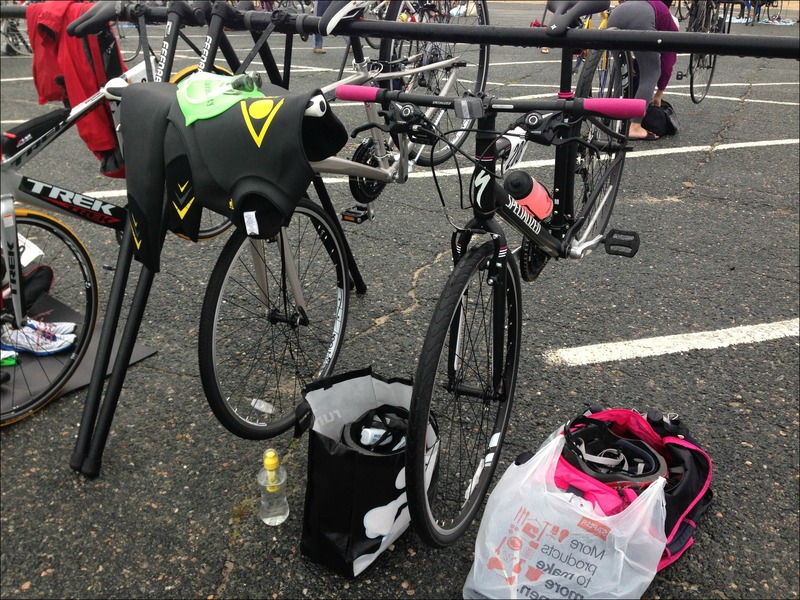 This race didn’t have assigned areas so we just made sure to know exactly where our bikes were (first row, third rack!). It’s definitely a challenge, but I enjoyed adding in biking and swimming to my workouts! A sprint is definitely a do-able goal for anyone looking for a new challenge! 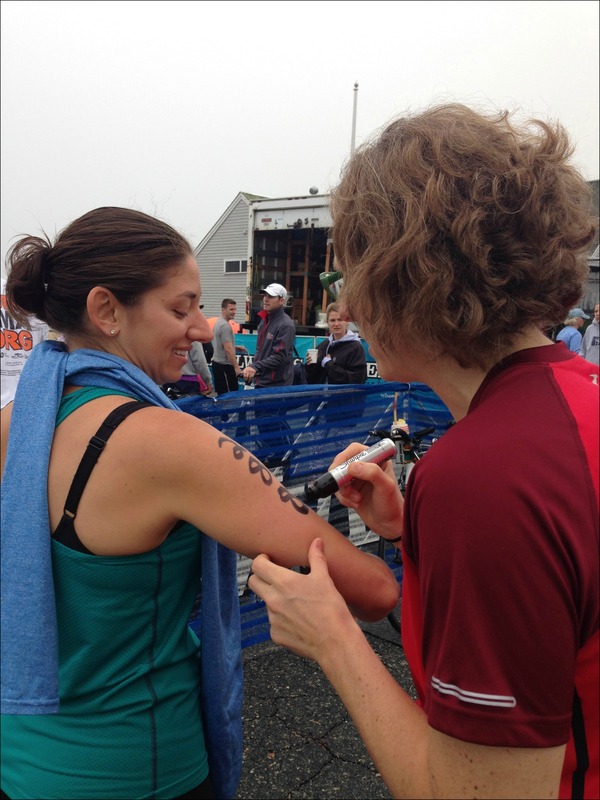 I am so impressed that you did a tri. I am too much of a baby to do an ocean swim and long bike ride. Can’t wait to read all about the race. I have mad respect for you on finishing your first triathlon! Heading over to read Part 2 now 🙂 One question I have for this part… is there a reason they don’t give out the ankle straps with the packets? It seems like you have enough to do when you get there to set up and get prepped. Seems like so many additional steps and more things to think about, I don’t think I’d be able to process it all haha. Let me know if you have any specific questions – I’m working on a tips/ thoughts post right now addressing any questions I’ve gotten!